Samsung released the Galaxy S9 and S9 Plus at MWC 2018 in Barcelona, with enhanced internal hardware and optics. We all know that the Korean giant makes 2 variants for its flagship device, one with the Qualcomm Snapdragon and other with the in-house Exynos processors. The latter, Galaxy S9 Exynos 9810 variant, was available in the hands-on demo section and has now been benchmarked by PhoneArena. This is Samsung’s flagship processor and the benchmarks results prove that it’s extremely powerful. It has been crafted using the 10-nm fabrication process, along with improved LTE speed and AI capabilities. The publication ran 3 different benchmark tests on the Exynos 9810 variant of the Galaxy S9, namely AnTuTu, GFXBench, and Geekbench 4. And as you can see in the chart below, the final results are quite surprising and shows off the processor’s might. It easily blows out all of the popular flagship devices from 2017 out of the water, proving just how powerful the 10nm Exynos processor actually is. 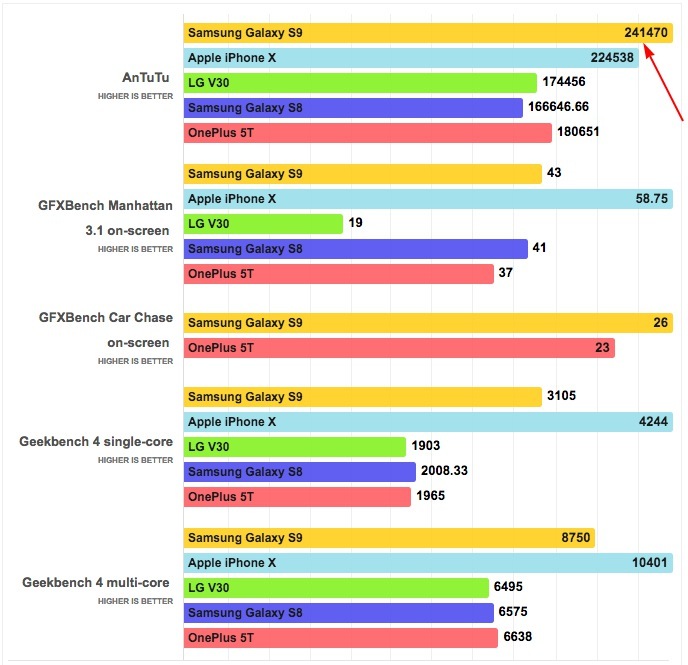 The Galaxy S9’s AnTuTu benchmark results beat each of its competitor, including the Apple iPhone X with a considerable margin. Though it falls behind the A11 Bionic processor in some benchmark tests, it easily outshines last year’s flagship SoCs by a good margin. This convinces us that Samsung’s international users, those outside the US, won’t be at any loss with this processor and can hope to enjoy a buttery smooth performance. But, if you compare it to the Qualcomm Snapdragon 845, the reference device scored even higher on the AnTuTu benchmark than the Exynos 9810. So the models with the Snapdragon 845 will also be quite powerful. The Korean giant’s Exynos 9810 processor is powerful enough to rival all of the upcoming flagship phones on the international stage in 2018. These demo devices were all pre-production models, not running the final version of the software, so we can expect the figures to drift a little. In addition, it has also been confirmed that Galaxy S9 and S9 Plus both will support Google’s Project Treble. This should have been evident to most as the search giant had previously said that devices that are powered by Android 8.0 Oreo out of the box will pack Project Treble support and seems to be the case here. This is great news for users who’re planning to buy the Galaxy S9 as they will be receiving the latest updates quicker than before. Samsung will no longer have to depend on its chip partners to roll out the firmware updates for pushing the latest flavor of Android to users. And I am all in favor of this. So, will you buy the Samsung Galaxy S9? Let us know in the comments below.